Q: On May 3, the US National Taxpayers Union(NTU) sent an open letter, expressing its opposition to the protectionist measures recently adopted by the US government on trade. More than 1,100 economists have signed the letter. Economists are convinced that increased protective duties would be a mistake. They would operate, in general, to increase the prices which domestic consumers would have to pay. The policy of higher tariffs would affect their international relations and world peace. The letter also warned the US government against protectionist measures it imposed at the start of the Great Depression in 1930. What is your comment? A: I have noted relevant reports. You may all have noticed that in recent days, the international community has been repeatedly calling on the US to respect the WTO and multilateral rules. There are also more and more people in the US who came out opposing its trade protectionist measures. This open letter you cited which was signed by US economists unmasked the nature and consequences of enforced tariff actions and once again proved that unilateralism and trade protectionism are just like building a wall of self-isolation, which is against market principles, international rules, and will be detrimental to everyone. Q: State Councilor Wang Yi said during his visit to the DPRK that China and the DPRK will step up communication on the Korean Peninsula issue. Does the DPRK support the four-party talks mechanism with China included? A: May I suggest you read the press release we issued on State Councilor and Foreign Minister Wang Yi's visit to the DPRK. State Councilor Wang Yi said that the DPRK had a very good grasp of the situation, and take quick and decsive steps accordingly to lead in positive changes on the Korean Peninsula. China supports and expresses congratulations to the successful inter-Korean summit and the issuance of the epoch-making Panmunjom Declaration. The meeting presents favorable opportunities for the political settlement of the Peninsula issue. 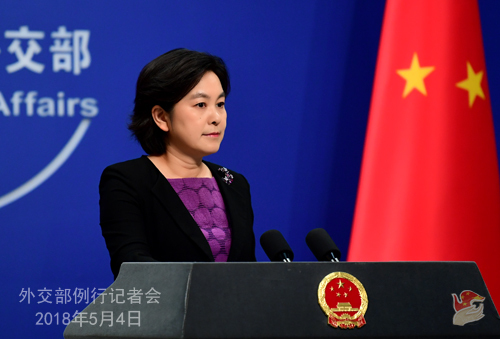 China supports the termination of the war status on the Peninsula and the replacement of armistice mechanism by peace regime, and supports the DPRK in shifting its strategic focus to economic development and addressing its legitimate security concern in the process of advancing denuclearization. China stands ready to maintain communication and strengthen coordination with the DPRK in this respect. Chairman Kim Jong-un said that the DPRK highly appraises China's positive contributions to peace and stability of the Korean Peninsula and is willing to enhance strategic communication with China. He also said that realizing the denuclearization of the Peninsula is the firm position of the DPRK. The positive changes that have taken place recently on the Peninsula are meaningful and conducive to the peaceful settlement of the Peninsula issue. The DPRK is willing to discuss how to eliminate the root causes that endanger peace on the Peninsula through resumption of talks and establishment of mutual trust. China has been making relentless and constructive efforts to promote the political settlement of the Peninsula issue and we are willing to maintain close communication with various parties in the future. Q: A violent dust storm and torrential rain in northern India has caused major casualties. What is your comment? A: We express our deep sympathy and sincere condolence to the major casualties and property loss caused by the severe dust storm and heavy rain in northern India. We mourn for the victims, and wish the injured a speedy recovery. Q: Media reports said that lasers from the Chinese base in Djibouti harassed US military aircrafts near the US base. The Pentagon's spokesperson said the US side has formally complained to China. What's your reaction to this? How will the above-mentioned remarks by the US military affect the relations between the two countries and militaries? A: The Chinese Defense Ministry has responded to this already. I will tell you that after thorough verification, we have explicitly told the US side that their so-called accusations are completely at odds with facts. Q: President Danilo Medina of the Dominican Republic said yesterday that they hope the Chinese mainland will admit Dominican students studying in Taiwan with scholarships. Will the Chinese mainland admit them ? A: China cares a lot about the Dominican scholarship receivers who are now studying in Taiwan. As long as they wish to study in the mainland, we will admit them. I believe that the mainland will become a warm new home for them. Taking the establishment of diplomatic ties as a new starting point, China is willing to expand our people-to-people and cultural exchanges, including promoting cooperation between universities so as to offer more convenience to our young students for their study in and visit to the other country. Q: First, French President Emmanuel Macron, who was visiting Australia yesterday, said that no country should be allowed to any kind of hegemony in the Asia-Pacific region when talking about China's rise. Do you have any comments? 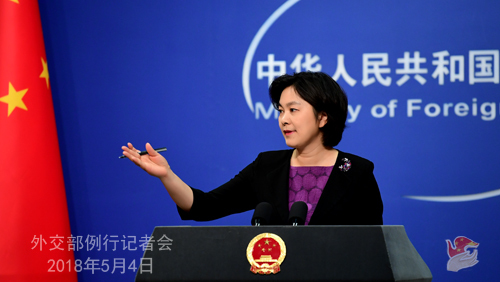 Second, the US warned yesterday that China would face consequences for the buildup of Chinese military and "militarization" in the South China Sea. What's your comment? A: I haven't seen the full transcript of those remarks as you mentioned. But you mentioned the word "hegemony". I am curious that in the eyes of all the people around the world, which country can be called as a hegemon and which country is exercising hegemony worldwide in various ways both militarily and economically. The relevant person had better get the answer right before making comments. As for your second question, I have talked about China's position yesterday. China's peaceful construction activities on the Nansha Islands, which is part of its own territory, including the deployment of necessary national defense facilities, are meant to safeguard China's sovereignty and security, and it is also a right that any sovereign state is entitled to. It bears not the slightest resemblance to "militarization", a label someone is trying to pin on us. 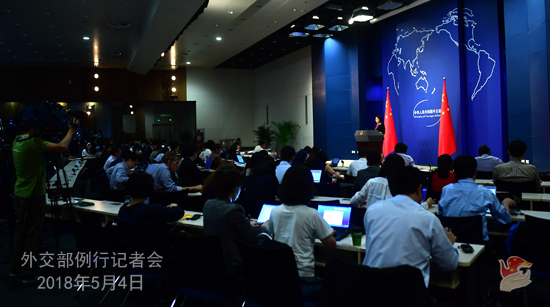 China will continue to work with all countries to maintain peace and stability in the South China Sea. It is worth mentioning that the US has been upping its military deployment and flexing its muscles in the South China Sea. That is exactly "militarization". They need to think about the consequences. We urge the US side to stop making these irresponsible remarks and think over what it has done so wrongly, and truly play a constructive role in preserving peace and stability in the South China Sea. Q: Have the China-US trade negotiations starting from yesterday wrapped up already? What are the outcomes? A: I have no authorized information to release so far. Q: US President Trump and the DPRK supreme leader Kim Jong-un will meet soon, allegedly in Mongolia or Singapore. Some also said that may take place in Panmunjom. Is that possible that President Trump will travel via Beijing? A: You may refer to the US spokespersons for this question. On China's part, we support and welcome all efforts that are conducive to promoting talks among various parties of the Peninsula issue and to the political settlement of that issue.